Inside the Holy Place were several items of furniture. Outside we had the bronze altar and laver, inside we have gold. Progression from bronze to gold. On the left was the golden lampstand. 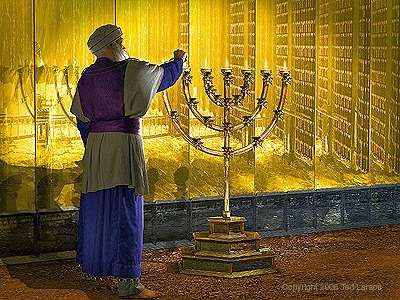 Whereas the bronze laver had virtually no description in the scriptures, the golden lampstand is described in great detail. It was not a candlestick as it is sometimes called. No candles were used in any Old or New Testament worship. Only oil lamps were used. The lampstand was made of pure gold and it weighed one talent, about 125 pounds. There was a main shaft with 7 branches; 3 to the right, 3 to the left, and 1 at the top. The Hebrew word for shaft, yarek, means "thigh"in 20 instances in the scriptures, "loins" in two, "side" in four, "body" in one instance. A further three instances connect yarek with birth. The shaft represents Christ, we being born of Him, through Him, He is the main vine, we are the branches. John 15:4-5 "Abide in me, and I in you. As the branch cannot bear fruit of itself, except it abide in the vine; no more can ye, except ye abide in me. I am the vine, ye are the branches: He that abideth in me, and I in him, the same bringeth forth much fruit: for without me ye can do nothing." A branch of the lampstand would be worthless as it could not stand on its own, would fall over, and cease to provide light. We must be connected to the center, to Christ, in order to produce any kind of light, but the light is through and because of Him. On the main shaft were three knobs. Three is the symbol of divinity. As mentioned previously, there were 7 branches. These can represent the 7 days of creation. The central branch had several golden features upon it: four bowls, four knobs, and four flowers. Four is the symbol of the earth. The six lateral branches each had three bowls, one knob, and one flower. The central branch came out of the top of the main shaft. This could represent Christ in mortal form. The six branches came out from the side of the shaft. The number 6 represents man, formed on the 6th day. We must connect to Christ to live and provide light. The entire shaft to branch connection represents God's peace extended to mankind through His Son who came to earth. Some writers described the knobs in the form of pomegranates. The pomegranate is an emblem of peace, and appeared on the hem of the high priest's robe. Three knobs or pomegranates on the shaft represent divinity, thus indicating God's eternal peace. On the central shaft were four pomegranates, representing the earth with its four corners, thus earthly peace, or peace through Christ's earthly ministry. He published peace, He was the Prince of Peace. The six branches each had one knob, indicating peace that can come to us through our connection with the Lord. The bowl, also translated cup or pot, were made to look like almonds. There is some confusion about the exact translation or interpretation about this facet of the lampstand. Some suppose the bowls were like leaves protecting a bud. These were lilies, representing beauty. The creations of God are beautiful. There is beauty in Christ, in all that He did, although man despised and rejected Him while in the flesh. From out of the flowers of the lampstand came the lamps themselves. Out of the flowers, beauty, came the light, the seven lamps. The light of the lamp stand illuminated the Holy Place, which was inside. It cast light on the table of showbread, the altar of incense, and the veil; the place of intercession. It was not the lamp that made the light, it only bore the light. The light came from the pure oil that was continually being put into the lamp. Similarly, we are called to carry the light of the gospel to all the world. We are not the source of that light, but are called to carry it.